After a long time coming, Oracle Cloud is unveiled as the database giant's entry into the market with a focus on social and custom infrastructure services. 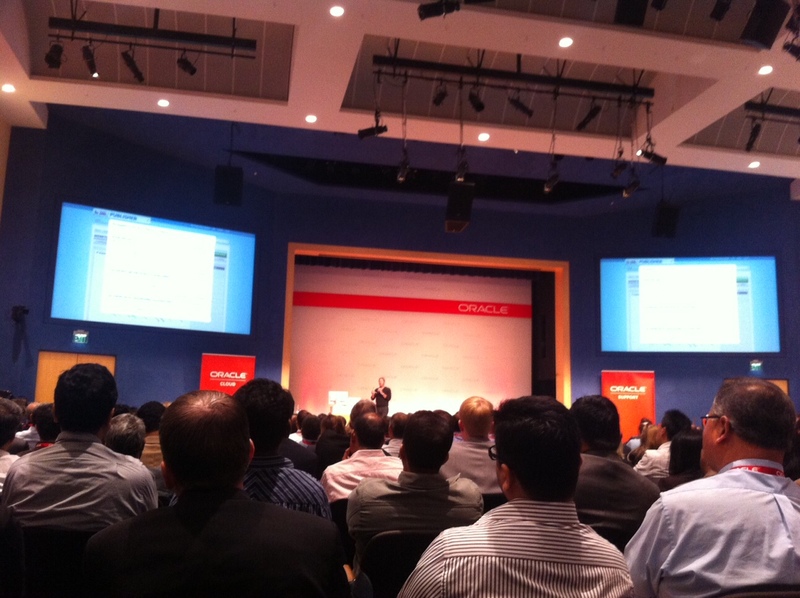 CEO Larry Ellison performing Oracle Cloud demo. Credit: Rachel King/ZDNet. REDWOOD SHORES, CALIF. -- Oracle CEO Larry Ellison unveiled his company's entrance into the public cloud space on Wednesday afternoon, simply titled Oracle Cloud. "It's been a long time coming," said Ellison. "We made a decision to rebuild all of our applications for the cloud almost seven years ago." Ellison explained that the venture was previously dubbed "Project Fusion," but Ellison acknowledged that one of Oracle's competitors referred to it as "Project Confusion." Also calling out the competition without naming any company in particular, Ellison asserted that Oracle Cloud is a fully-fledged cloud solution with everything a customer would need included with services for platform, application, custom infrastructure, and social. "Having socially enabled application doesn't mean we have a social network," Ellison said, explaining that's only one part of the puzzle. Ellison continued to say that Oracle now has social services that allows the hardware and software giant to do something called "social relationship management." Ellison remarked that's a little different from customer relationship management, but rather working with people before they are customers to build relationships so that they will become customers. Oracle Cloud is rolling out with more than 100 standards-based, enterprise-grade applications for services dedicated to databases, Java developers, mobile, analytics, and more. Those industry standards include SQL, Java, and HTML5. Ellison quipped that, naturally, the Oracle Cloud will be running on the Oracle Databases: Exadata and Exalogic. "Your cloud data is not co-mingled with other customers' data," Ellison said. "It's a big difference between our cloud and other clouds provided in the market." While simultaneously being advertised as the "most comprehensive cloud on planet Earth," another key element to Oracle Cloud that Ellison tried to emphasize was customer freedom. "We think a modern cloud lets you decide when you want to upgrade -- not have the cloud vendor tell you when you upgrade to the next version of the software," Ellison said. "We will let you, within reason, schedule the upgrade." Also always one to repeat his belief in building technology upon "industry standards," Ellison noted that Flash is not involved because then the cloud-based interfaces won't run on Apple's iPhone and iPad. "Some people built their system with a Flash UI," Ellison remarked. "I won't mention Workday by name." At the platform level, Ellison admitted that Oracle Cloud is "kind of similar to Amazon" because they're both elastic clouds, and most other competitors don't "respond to capacity on-demand." Ellison recited some other differences between Oracle Cloud and competitive offerings, including the ability to be able to "move things gracefully back and forth" between the cloud and on-premise platforms as well as allowing end users to develop and deploy websites without any assistance from programmers. Essentially, Ellison reiterated that everything available to customers in the cloud is also available on-premise, and vice versa. The company leader revealed that several "key strategic acquisitions" helped make the Oracle Cloud happen, but he added that "simply buying things would not have been enough." Furthermore, Ellison explained to the audience made up of customers and media at Oracle's Redwood Shores headquarters that it took a long time, manpower, and money to unveil a cloud offering of this kind and scale. Ellison then pointed towards SAP, commenting that it "made a very interesting announcement" that it wouldn't have any cloud offerings until 2020. Ellison said that he understood this, but added that he doesn't expect SAP to even meet that deadline. "2020. A terrible year to get into the cloud," Ellison joked to much laughter from the audience. The Oracle Cloud is now available to customers.